Here are two more up close and personal views of the D4Y tailfin from Ken Glass. These detail images show very clearly the brush painted code numbers and stencilling details in both black and white. The strong olive brown caste to the paint is illusory and caused by the film/processing. It demonstrates how colour photographs can be persuasive but ultimately misleading. The actual deep black green colour, with surface variegation and fading on this example, is sometimes described as "oil green" in contemporary documents. 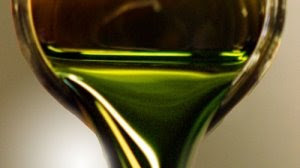 Nowadays "oil green" is often used to describe a lighter, slightly greyish green - like a sage green - but then it was more usually a term meaning a very dark green of strong chromatic intensity. Fascinating commentary on how the photographic process alters the colors and how they are perceived. I remember seeing the images of this tail section while I was building my night fighter Judy back in 2004- the same model that you kindly posted here last year. If you look at those images you will see my attempt to have a "scale effect" of the olive brown hue you described today. Thank you for another great insight into relics and colors. That rudder would certainly be manly additional above the basement billiards table! A really broad and murky subtopic, I know, but one I've often mulled over. TIA and keep up the great posts! Thanks for the comment. Sorry, can't help with fonts! The whole subject of IJN codes and units is an arcane one dealt with at length (I nearly wrote ad nauseum!) at j-aircraft.com. They may be able to help. 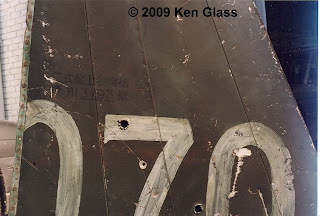 JAAF had stencil sets for airframe markings but some of the larger numbers, aircraft within unit, etc., appear to have been hand-painted freely. 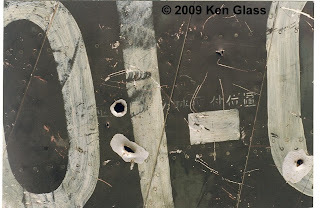 An extant set of camouflage paint directives and match plates recovered in Thailand has nothing about the subject of letters and numbers.